Finesse, hull 33 of 39, is a rare opportunity. She is a Lyle Hess design and factory finished by Sam L Morse. The Falmouth Cutter is featured in John Vigor's "Twenty Small Sailboats to Take You Anywhere." She is trailerable trailer not included, and she has a functional mast tabernacle for that purpose. Auxiliary propulsion by a Yanmar 1GM10 diesel engine, with 15 gal fuel tank. Converted to 330 A-hr house batteries with additional start battery. Propane stove with broiler, running fresh water, raw water foot pump, Lavac toilet with 15 gal plastic holding tank, Maritron electronics with NMEA 2000 network, Garmin VHF-300 radio, Garmin AIS-600 transponder, Technautics refrigeratorfreezer, and many other accessories and equipment. An extensive equipment list is available. 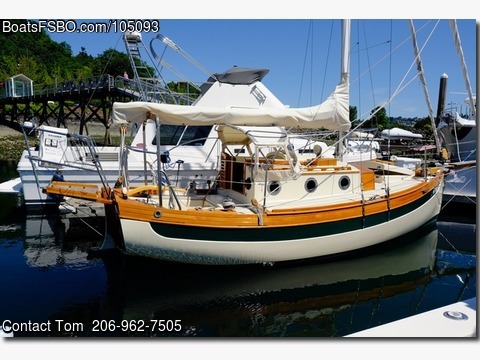 Finesse is extensively restored and outfitted, this bluewater cruiser is in excellent condition and ready to go. She should be seen to appreciate her.